Bio: Leoni Duff lives in Launceston, Tasmania. Her first love was music and she studied at the Conservatorium of Music in Hobart, where she majored in piano. 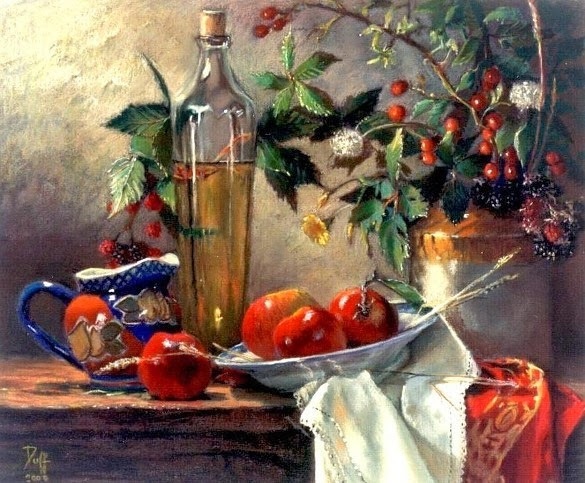 Having an lively interest in art and art history, during the 1980’s Leoni turned increasingly to painting, starting with watercolour and progressing to oils. Largely self-taught Leoni has relied on both historical and current art resources for guidance and direction, not neglecting the early Australian artists, especially the artists of the Heidelberg School. She confesses to be strongly influenced by the Dutch still life masters, Vermeer with his light filled interiors, and the still life of Chardin. 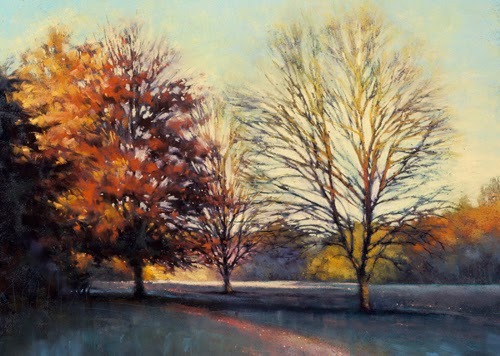 Having started with watercolour, then oils, Leoni now works exclusively in pastel. She is in demand for pastel teaching and has been invited to tutor art classes around Australia including the McGregor Art Schools, University of South Queensland. Leoni is the recipient of many awards, including several People’s Choice awards. She is the guest artist for the 2014 Salon International de Pastel in Saint-Aulaye, France. Navigation: Main menus remain accessible on top of page. Image View: Thumbnails enlarge in viewerwindow on same page, and may be saved; information on size is not provided – presumably all are in pastel. Blog: Yes, under Art-Tour, France – but it is more a travelogue. Bio: Based in Belfast, Northern Ireland, Emma works as an artist and illustrator. She graduated from Kent Institute of Art and Design as an illustrator in 2007, and has worked on portrait commissions, produced original fine art series for galleries throughout Ireland and illustrated several books. Having discovered pastels very early in her career Emma knew that this was the medium she wanted to develop most in. An equal passion for animals has fuelled a love of painting them. After experimenting with velour pastel paper Emma found a surface that has a spongy soft texture whilst allowing great detail. Recent projects include a commissioned portrait of a famous Real Madrid footballer which was filmed for UEFA Championship Live and broadcast worldwide. Also the release of the second book in the ‘Charlie Crow’ children’s book series which has been read in over 200 schools in Northern Ireland. A member of the Pastel Society of Ireland, Emma exhibits regularly in groups and plans her first major exhibitions this year. Her aim as an artist is not only to improve in the medium of pastel, but to document her work in progress through photos and videos hoping to eventually have a time lapse video shown beside every painting of the entire process. Subjects: Emma says : “I’ve always loved painting animals and people. It’s only recently I’ve pushed myself to get better at landscapes, interiors, water, skies, sunlight, all the things that make paintings interesting. I now find myself taking as much pleasure in painting a windowsill as I would a face. My favourite subject to paint is definitely my own dog who features in the painting shown. I know her so well, she inspires ideas, is patient with me when I ask of her, and has a real presence that not only I feel as she’s one of my most popular series. Style: Realistic. Emma's affection for her subjects is apparent in her treatment. Navigation: Easy; all main menus remain accessible. Image View: Thumbnails enlarge in pop-up window on same page, and may be scrolled; download is permitted. Demo: Go to the blog for step-by-step development of paintings. Bio: Award-winning artist Marla Baggetta attended Art Center College of Design in Pasadena, California, where she got her BFA Hons in 1983. She worked as a commercial illustrator for a resplendent client list that includes Nissan Motors, Houghton Mifflin, and Disney, before she decided to devote herself full time to painting the landscape on her 1993 move to Oregon. She is a signature member of the Pastel Society of America and the Pastel Society of Oregon. 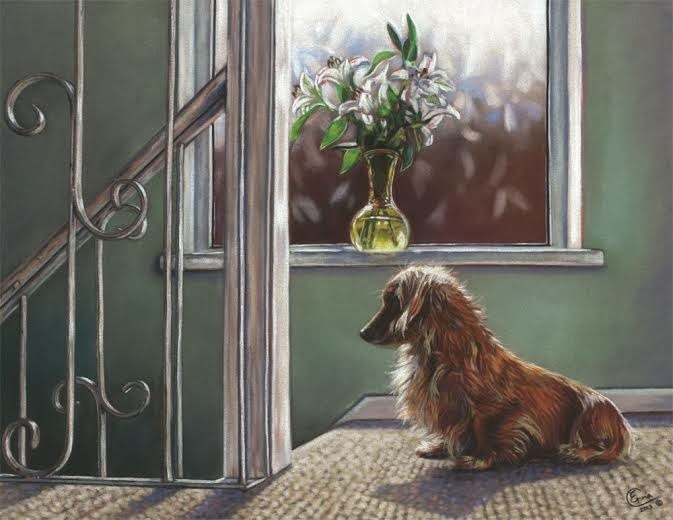 She has won numerous awards for her paintings including Arts for the Parks top 100 in 1999, Best in Show, Oregon Pastel Society 2003 and Bronze Award for the International Association of Pastel Societies Exhibition, 2000. She has been featured in the Pastel Journal. She is included in Pure Color; The Best in Pastel. Marla is sought after for painting workshops in the Portland area and has taught at Art Center College of Design, Pacific Northwest College of Art, Creative Arts Community-Menucha and West Linn/Wilsonville Community Education. She is represented by the RiverSea Gallery, Astoria, Oregon. Style: Representational. Baggetta says that she is a great believer in the fundamentals of painting; drawing, composition, color theory and the thought that paintings communicate an idea through this vocabulary. Technique: “My painting process is a very active one where my first marks and impressions are usually bold and gestural. Then I settle in and make assessments and refinements. The last marks are usually slow, quiet ones, as I am making small moves to find my way towards the finished piece. I'm hoping to capture the "aha!" that originally attracted me to my subject. Each one of my original pastels is done on museum grade sanded pastel paper. I use a variety of brands of soft pastel such as Schmincke, Unison, Terry Ludwig, and Diane Townsend, just to name a few. Each brand of pastel has different characteristics that I use to accomplish a variety of strokes and washes within a piece. The final painting is lightly sprayed with a fine fixative before framing." Publications: Pastel Step by Step. Walter Foster Publishing, 2004; ISBN-10: 1560108010. Navigation: Main Menu remains accessible at top of page. Gallery: Portfolios: Trunk Sale; New Pastels; Landscapes; Vases; Goddesses; 100 variations; Figurative; Reproductions; Sold Archives. Image View: Thumbnails open in a viewer and may be scrolled. Download is blocked. Information is provided on title, medium and dimension.